The PopSockets Grip offers a comfortable and secure grip for taking the perfect selfie or texting on the go, and can also be used as a portable stand for watching your favourite shows. Get a grip on your phone with the PopSockets Grip - a fun and stylish phone accessory that offers a more secure grip for you to scroll, snap and share. Thanks to the PopSockets Grip, you can stream videos, send texts and take snaps with ease. Hold onto your phone with unbeatable comfort and convenience, while making the most of your smartphone experience. Simply pop to expand and collapse to lay flat. With its neat, foldable design, the PopSockets Grip provides you with a portable grip and stand for your phone while maintaining its good looks. 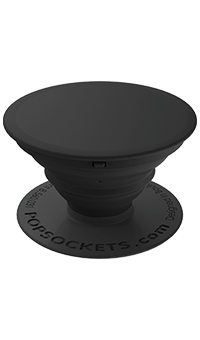 Thanks to an extra-strong adhesive gel, the PopSockets Grip is designed to be reusable. It sticks to most cases and can be repositioned as often as you want, as and when required.